UNCG Club Football prepares at practice for its first home game against UNC Chapel Hill. With fall just around the corner, it’s finally time for sweatshirts, pumpkin spice and – for the first time in more than a decade – Spartan football. UNCG Club Football, one of the newest club sports on campus, will host its season-opener against UNC Chapel Hill this Saturday, Sept. 17, at 1 p.m. at the UNCG Recreation Field. Students started a football club in the 1980s and again in 2001, but the teams only competed for a few seasons. DiJon Mason – the club’s current president and a senior kinesiology major – has been anxiously awaiting the return of football on campus for two years. Club sports are recognized student organizations that allow students to continue to play sports at a competitive level while developing and refining leadership skills. The Club Sports Program, which has been an integral part of campus life for more than 30 years, currently has 19 active club sports – from volleyball to Quidditch and nearly everything in between. The Men’s Rugby Club is the longest-established active club sport on campus. The first step in starting a club sport? Holding an interest meeting. Mason held the first interest meeting in the fall of 2014, and then moved forward in developing a constitution. The club was officially established in the spring of 2015 and has been working on building a roster and coaching staff ever since. 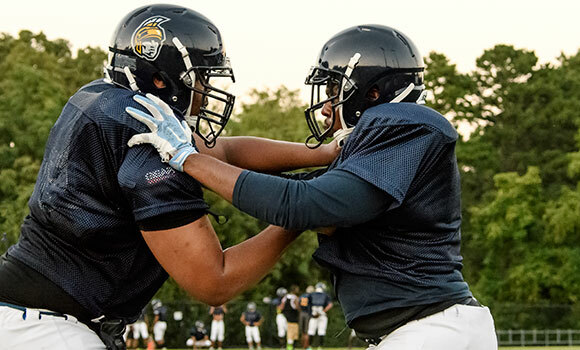 UNCG Club Football is affiliated with the National Club Football Association (NCFA), a club tackle football league with 25 teams across the United States. UNCG will compete in the South Atlantic Conference, which includes in-state rival UNC-CH as well as Columbus State University, Kennesaw State University and Middle Georgia State University. While the team hopes to compete for a national championship, it’s also focused on the personal growth of its players. It’s also about brotherhood, something that club treasurer and fellow kinesiology major Blaine Ayres has experienced since joining the organization. What can Spartans look forward to when the team takes the field this weekend? A whole lot of grit. Want to learn more about club sports at UNCG? Visit recwell.uncg.edu/competitive-sports for more information.